Many things about the Nissan Sentra have changed over the years. Nissan went all out when they redesigned the Nissan Sentra in 2007. That was the year that marked a new beginning for this car. Its bold design and technology paved the path for other automobile companies to raise its standards. It was no longer dubbed the baby in the Nissan family. The Sentra is all grown up now and offers features that most would expect to find on higher end luxury cars. Fast forwarding to today, the Sentra offers continued bold styling and an affordable price that keeps consumers coming back for more. The Nissan Sentra is slightly restyled for the 2010 model. The changes are apparent on the inside and the outside. The interior features a new instrument cluster that reveals a bright white color instead of the orange color that had been previously in the 2009 model. Also the interior has a redesigned radio panel that comes with an optional navigation system. The exterior features a new front grille and headlight arrangements. The badge on the Sentra has also changed. Instead of branding the car 2.0 SL, Nissan has now dropped the 2.0 and now has branded the vehicle with just SL or SR. 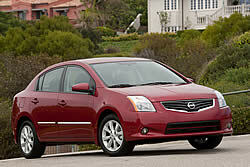 The test car featured is the new 2010 Nissan Sentra SR. The SR is a sporty yet affordable car that was just added to the lineup for 2010. In my opinion, the added package is a great value because it allows the consumer access to more features like Bluetooth technology, radio volume controls on the steering wheel, leather wrapped steering wheel, blackened boarders for front and rear headlights and taillights, a spoiler, and more without breaking the bank. On the road, the vehicle performed well and its smooth ride only enhances its overall feel on the road. Even when the Sentra SR hits a really big bump, control is maintained. That’s all thanks to Nissan’s advanced suspension system. It offers ripple control shocks that improve handling and help eliminates vibrations that can be felt in the vehicle. Also, the Sentra comes equipped with torsion beam rear suspension with rear stabilized bars and front independent suspension with stabilizer bar. The Sentra boasts a powerful 2.0 Liter DOHC 4-cyliner engine that fronts its CVT transmission, which is shiftless. The 2.0 Liter engine also nicely accommodates 140 Horsepower with 142 ft-lb of torque that supplies rocket-like off the line acceleration. However, when the vehicle reaches higher speeds, the acceleration cools down a bit making it somewhat sluggish past 35 MPH. The Sentra accelerated from 0-60 in 10 seconds. I found that number not as impressive, but still decent enough to get the job done if you are trying to pass a slow vehicle. The brakes on the Sentra also give you the feel of control. It features power assisted front disc brakes and rear drum. It stopped at a respectable distance, giving the driver peace of mind should an emergency situation presents itself. Fuel economy is also reasonable at 34 MPG highway. The Sentra SR has lots of safety features that will protect all passengers in the event of a crash. The SR has six standard airbags including side curtain and front driver and passenger airbags. The vehicle itself is equipped with vehicle dynamic control (VDC), antilock brakes, and electronic brake force distribution (EBD) that works along with the ABS brakes by sending extra power to the rear wheels to compensate for extra weight in the vehicle. Another interesting quality in the Sentra SR is the interior design. With a bold and curvy-like structure, it looks more like a luxury car than your standard base model car. Inside, the SR features a 6-speaker audio system including iPod connectivity. There are two ways to connect to your iPod. There is an available Interface System that puts info on the dash display and allows the consumer to brose through songs with the audio system controls; or, the iPod can be plugged into the standard auxiliary audio input jack. The auxiliary port was easy to work, but I found that the plug in for the iPod that allowed you to control it with the radio controls somewhat complicated. The sound coming out of the speakers was surprisingly good for not being equipped with the Rockford Fosgate audio system, which is a feature on the higher end Sentra’s. The SR I test drove was not equipped with leather seats, but offers a variety of choices for cloth interior selections. Storage space in the SR is ample in the glove compartment, above the radio stack, and in the trunk, which gives you plenty of space, no matter what the load. Comfort is also good with lots of support in the front and rear seats. Rear headroom is respectable, so you won’t find yourself hitting your head. The exterior is equipped with 16-inch alloy wheels, fog lights, and a rear spoiler that give the vehicle its sporty appearance. The intelligent key allows you to gain access to the vehicle without ever having to take the key out of your pocket. All of these amenities and more is what makes the 2010 Sentra SR a better bet.